EUREKA, Mo. — Every week in geometry class, more than two dozen Eureka High School students stow their backpacks and cellphones in their lockers and don hard hats and goggles. Instead of sitting at desks, they slice wood with power saws, measure wood to be cut and hammer together the skeleton of a new tiny house — a fully habitable dwelling, just 26 feet long — all with little teacher help. In less than two months, they have almost finished building the entire frame of a 14-by-26-foot house from the ground up. Mike LaChance, Ritenour School District’s assistant superintendent for curriculum and instruction. 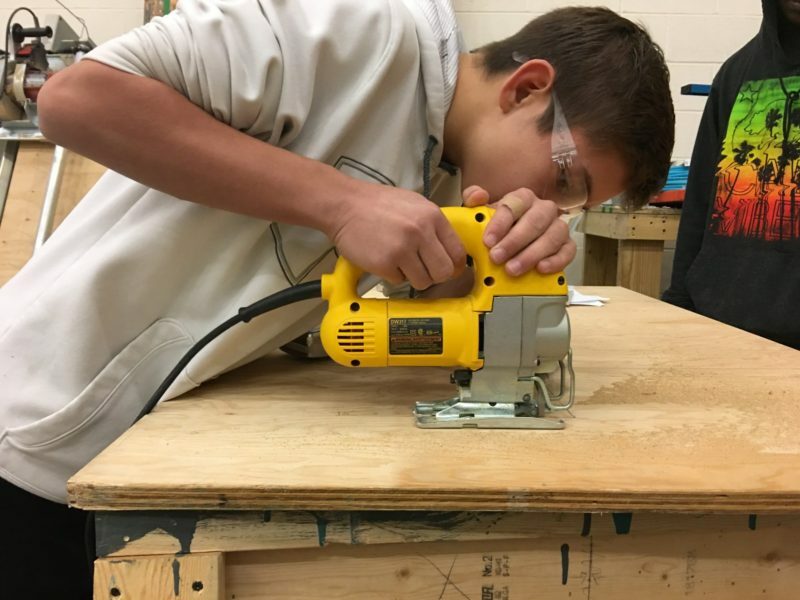 Eureka High in suburban St. Louis County, Missouri, is one of more than 400 high schools nationwide and three in the St. Louis area that have adopted a “Geometry in Construction” class, a class developed by two Colorado teachers who wanted students to take math out of the textbook and into real life. 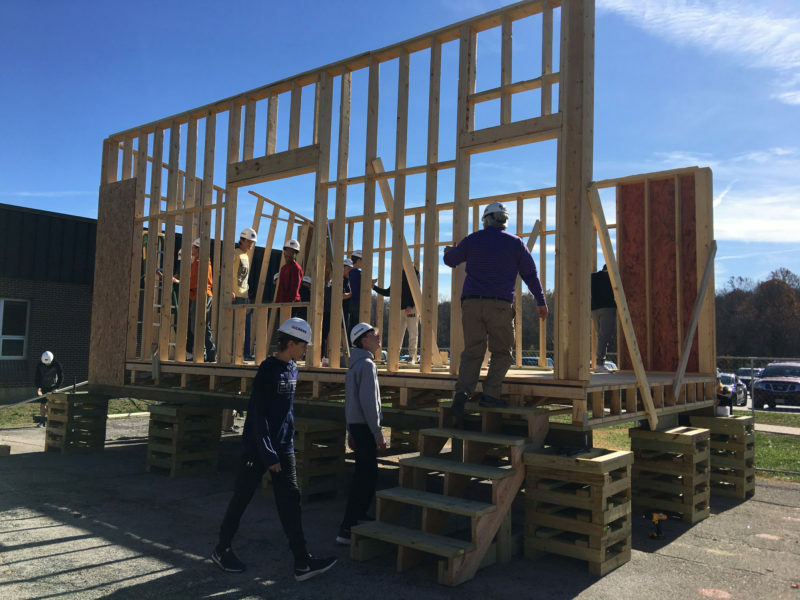 Students in these classes use geometry to build their own tiny houses or other construction projects. Asked their opinion of the class, students said they like being able to work outside with their hands “instead of just sitting in the classroom.” They said they know the math they’re learning is important and useful because they’re building something real. “It’s not going to waste,” said Morgann Beatty, 15, a Eureka High sophomore. School officials echoed those sentiments. They are looking for ways to get kids to care about math, at a time when the U.S. ranks an unimpressive 38th out of 71 countries in math on international tests. Three girls sat on the ground in the hot sun during a class at Eureka High last fall, doing nothing but talking and watching everyone else build the house. The inactivity wasn’t by choice. They weren’t allowed to work because they didn’t finish their homework, explained Gregg Swarts, 15, a sophomore, while he nailed a board into a wall of their house. Later, the three will have to come in early before school to do the construction work they missed. The rule may seem harsh, but students say they like that. “What the kids don’t realize is, the teachers want you to learn,” Gregg said. At the end of every class session, “Geometry in Construction” teachers require students to grade the work of each of their teammates and write down what they accomplished. David Luecke, an industrial technology teacher who co-leads the class at Eureka High, said the class is structured this way so students learn how to be responsible and prepared for the working world. The class requires lots of trial and error. At a Eureka High class one day last fall, the student groups stumbled into different kinds of problems: A certain wooden board was too wide, or a plank kept moving when hammered. But few went to the teacher for help. Instead, students coached each other, suggested new techniques or pointed out a mistake that needed correcting. Students never work alone, but always in four-person teams, which Luecke shuffles every few weeks. Students said it’s easy for them to see the payoff of the class. When Eureka High sophomore Casey Baker checked with his classmates in other geometry classes, he discovered something that made him smile. In terms of learning geometry concepts, his class was far ahead of theirs. Does it work in every school? There’s no comprehensive external study showing whether students who take this class have higher test scores than those enrolled in traditional geometry classes. But one small internal study at a couple Colorado high schools showed students in the class had higher average math scores than their classmates in regular geometry classes. Scott Burke, a high school teacher and co-founder of Contextual Learning, the Colorado company that developed “Geometry in Construction,” has watched some school administrators turn his class into a remedial course, in the mistaken belief that it’s easy. But that kind of thinking is flawed and is one of the most common reasons the class will flounder, he said. That’s because the class’ expectations for students are higher than in a traditional math class, where the worst possible outcome for inferior work is a bad grade, Burke said. In this class, inferior work means a house’s door won’t close or the house will fail a building inspection. It’s a level of expectation that even surprises many honors students, Burke said. 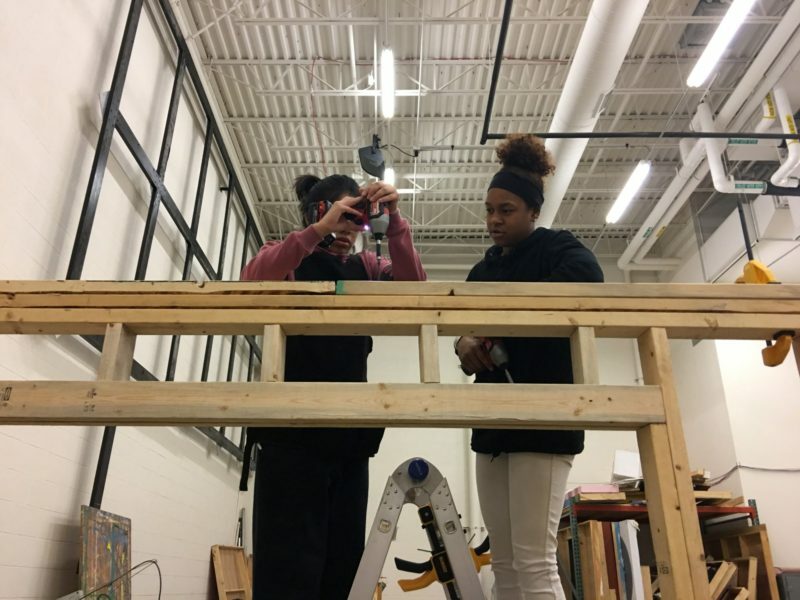 Nationwide, more than 400 high schools offer “Geometry in Construction” class. “I’ve actually seen honors level kids before completely fall apart to tears,” he said. Burke admits that not just any school can adopt the class successfully. Schools must invest staff, time and money, assets that under-resourced high schools might not have. For example, the class curriculum, four-day training and consultation help from Contextual Learning costs $1,695 per teacher. The school must also find funding for the actual building materials. But Burke said this class has succeeded in both low-income schools and in those that are more well-off. The primary requirement for success, he said, is dedicated teachers. So what happens to the houses?